For other uses, see Blue chip. Replica of an East Indiaman of the Dutch East India Company/United East India Company (VOC). 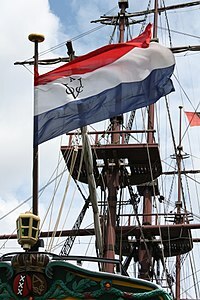 The Dutch East India Company was the first corporation to be listed on an official stock exchange. In Robert Shiller's words, the VOC was "the first real important stock" in the history of finance. The VOC was possibly, in fact, the first ever blue-chip stock in its modern sense. 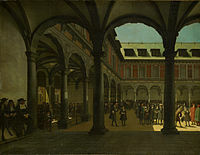 Courtyard of the Amsterdam Stock Exchange (Beurs van Hendrick de Keyser in Dutch) and the world's first formal stock market in the 1600s. A blue chip is stock in a corporation with a national reputation for quality, reliability, and the ability to operate profitably in good times and bad. The most popular index that follows United States blue chips is the Dow Jones Industrial Average, a price-weighted average of 30 blue-chip stocks that are generally the leaders in their industry. All companies in the Dow Jones Industrial Average are blue-chips, but the Dow Jones Industrial Average is an index that does not include all companies that are blue chips. Nevertheless, it has been a widely followed indicator of the stock market since October 1, 1928. As befits the sometimes high-risk nature of stock picking, the term "blue chip" derives from poker. The simplest sets of poker chips include white, red, and blue chips, with tradition dictating that the blues are highest in value. If a white chip is worth $1, a red is usually worth $5, and a blue $25. ^ "NYSE Group, Inc". Nyse.com. Archived from the original on 2012-10-17. Retrieved 2011-09-19. ^ "Dow Jones Industrial Average: Stock Index Summary". Bloomberg. 1928-10-01. Retrieved 2011-09-19. ^ Merriam-Webster, Merriam-Webster's Unabridged Dictionary, Merriam-Webster. ^ Prestbo, John (12 March 2008). "Ever Wonder How 'Blue-Chip' Stocks Started?" (PDF). Dow Jones (internal news item). Retrieved 22 June 2018.